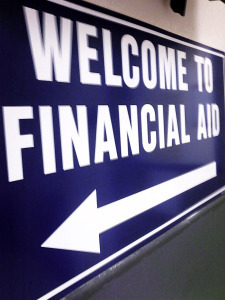 Home › FAQ › How Do You Apply For Financial Aid? If you’re like most people, you can’t afford to pay for your entire college education without assistance, but you may not know how to apply for financial aid. The U.S. Department of Education makes applying for financial aid quite easy, and all you have to do is gather a few financial documents and fill out the FAFSA form online. The FAFSA application lets you apply for loans, grants and work-study programs all at the same time. The best financial aid to receive is a grant because it doesn’t need to be repaid, and the Federal Pell Grant gives you up to $5,500 per school year. According to the Federal Student Aid website, you can receive Pell Grants and direct subsidized loans for a certain number of semesters, and after you’ve reached your limit, you can continue to apply for direct unsubsidized loans. Pell Grants are available for up to 12 semesters, while the number of times you can receive a subsidized loan depends on the amount you’ve received over your lifetime. Subsidized loans don’t accrue interest while you’re in school, but unsubsidized loans start accumulating interest as soon as they’re awarded. You need to gather a few materials before you start filling out the FAFSA form. The first thing to do is to request a PIN so that you can legally sign electronic documents online. It’s possible to get the PIN while filling out the FAFSA, but if you do this step ahead of time, you can avoid processing delays. The next step is to gather your personal identification and financial documents, such as your Social Security card, driver’s license and the previous year’s tax return. You can also transfer your tax information electronically from the IRS website when prompted by the FAFSA form. More information can be found at the Federal Student Loans website. The first time you fill out the FAFSA, you can simply click Start a New FAFSA. Your name and Social Security number must match the ones on your Social Security card, and you can create a password to save your progress, in case you don’t complete the FAFSA in one session. Your password is different than the PIN you create to electronically sign documents. After starting a new FAFSA, you can follow the instructions on-screen. The process takes about 30 minutes, and at the end, you can choose all the schools to send applications for financial aid. With just one application, you simultaneously apply for aid at all the schools you might attend. After submitting the application, contact your school’s financial aid office to ensure your application was received. The people in your school’s financial aid office will do the rest of the work in getting all the grants, loans and work-study opportunities for which you qualify, and they will let you know what you were awarded before the semester starts. If you don’t qualify for federal grants or direct loans, you may still be eligible for financial assistance from your state. If you plan your college coursework carefully, you can finish your degree with minimal debt and low interest rates. The faster you repay your loans, the less money you’ll spend on interest. After you’ve decided on a major you’re sure you’ll complete, take the steps to learn how to apply for financial aid.